More than 4,300 donations from North Texans have been made to President Donald Trump's 2020 campaign to date, totaling about $800,000. 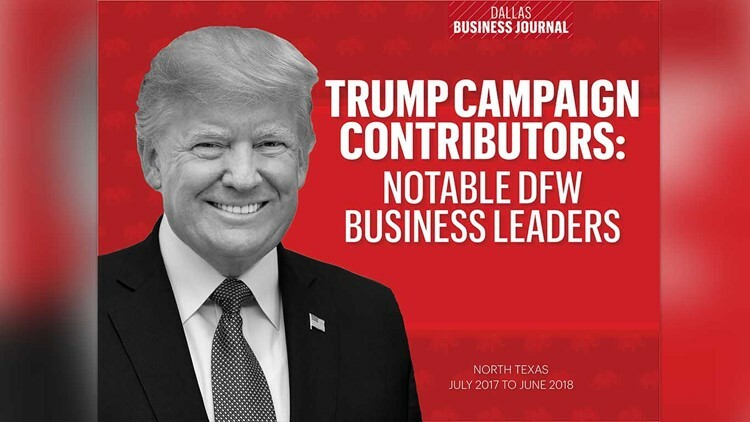 American City Business Journals, Dallas Business Journal's parent company, compiled the data from the Federal Election Commission on all contributions to Donald J. Trump For President Inc. made between July 1, 2017, and June 30, 2018. Those donations include gifts from some notable leaders and executives in the Dallas-Fort Worth community. Steve Winn, who is the CEO of Richardson public company RealPage Inc., has given $5,400 between primary and general election campaigns. Kirk Dinkins, who owns three Fuzzy's Taco Shop locations in North Texas, and Texas State Senator Donald Huffines have also contributed to Trump’s 2020 campaign. You can see other notable DFW leaders that contributed to the campaign by clicking here. The maximum donation allowed by an individual is $5,400 per calendar year. That's $2,700 for the 2020 primary campaign and $2,700 for the presidential election. In total, 52 North Texans maxed out their donations for the primary and general elections between July 2017 and June 2018, giving a total of at least $5,400. Here’s the complete list of North Texas contributors that donated the maximum amount. Please note that these individuals may have given additional donations since making these initial contributions or will be eligible again soon to make more donations once the calendar year limitation runs up. Trump has raised more than $42 million total nationwide since he took office, and the average contribution amount among North Texans sits at just above $187 per donation. Trump, a Republican, won 52.2 percent of the vote in Texas in 2016, while Democratic candidate Hillary Rodham Clinton won 42.3 percent. To date, individuals in Texas have raised $1.3 million for Trump — the highest amount among the 50 states. North Texas donations make up more than half of that figure. To view this story in its original form on DallasBusinessJournal.com, click here.